"I've hired Dressing Well three times over the past decade because they are the very best at providing advice and counsel to sales professionals that want to look and feel they are dressed for success when they are in the field meeting with customers, brokers and consultants. In a very competitive environment one of the ways we can distinguish ourselves from our competition is how we professionally dress. Mary Lou and her team assist us in keeping our folks excited and informed on how they can present the most professional and attractive image. This results in a competitive edge that helps us continue to arguably be the most recognized and respected health plan in America!" 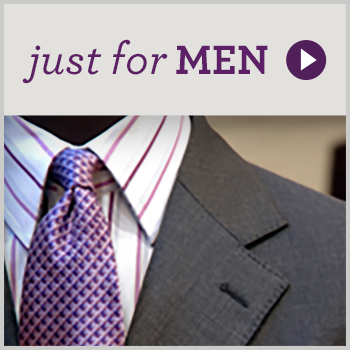 "If you ever doubt the importance of a first impression attend a Dressing Well seminar. Their excellent workshop for our organization helped our women CPAs sharpen their professional image to proudly represent their firms and companies." "Mary Lou Andre brought the house down at our Executive Women Summit in Minneapolis this week. Few speakers have struck such a positive and proactive chord with our field staff. The feedback has been incredible. It is a pleasure to be part of a management team that can identify and secure speakers for our conferences that are so in tune with what emerging female leaders in our company need to develop and succeed." "I just wanted to let you know how much we enjoyed your presentation yesterday. I appreciated your introductory statement, "it's about confidence first." This set the tone I was looking for. Your presentation, combining humor, anecdotes, wisdom, insight and years of experience, was a pleasure to observe. My staff members are still raving about your presentation and are grateful to have been given an opportunity to hear from an expert in the field." "Thank you for the first-rate presentation you gave our women attorneys today. You’re a keen observer of how women dress and you understand how one’s attire can enhance or detract from her professional image. You offered valuable advice and insight into what’s appropriate for professional women in today’s business culture. Thank you." "You took a tough topic at our firm and made it relevant. Thank you." "Thank you for an excellent presentation yesterday. It satisfied an important need within our member institutions and the feedback has been extremely positive." "Dressing Well worked closely with me to provide direction on a dress code that "fit" my objectives. Our challenge was to develop and implement an approach to dressing that would garner acceptance from, and appeal to, an entire Corporate Division. With her impeccable fashion sense, and intuitive business savvy, Mary Lou Andre and her team won the respect of every individual involved in our on-site sales operations. To a one, these seasoned salespersons were "energized" by the presentation and the impact has been to galvanize our sales efforts. I would highly recommend Mary Lou's services for any business seeking to improve the performance of its employees." "Thank you, thank you, for an outstanding program today!!! We had a record number of women attend and virtually everyone stayed the full 1 1/2 hours for the seminar, which was indicative of the quality of the presentation. I was very impressed with you and the content of your presentation. I think we should see some improvements in our women's wardrobe choices so as to reflect a more positive and professional image. Thanks again for a terrific program!" "It was a pleasure to work with you, updating the professional image of our sales team. You were a true professional from beginning to end. The personal consultations were a true asset in guiding the sales staff with individual tips. The employee fashion show reinforced the new "look" and was entertaining and professional. Your expertise in the industry has helped to take our J-Team style to a new level. They look marvelous! Thanks again, Mary Lou. Please pass along our appreciation to your staff. I look forward to working with you again soon." "We appreciate your ability to make your remarks relevant to our environment and were especially impressed by the subtle, yet significant changes we saw in the professional image of our employees." "Thank you for the difference you have made in the Estee Lauder Executive Staff in New York and Canada. Your seminar has raised the bar in the standard that is expected from Estee Lauder. I look forward to our on-going relationship." "You were a pleasure to work with leading up to the meeting, and when we finally met in person my initial impressions of you from our phone conversations were confirmed — professional, polished and inspirational!" "After working with you as a private client for several years, I knew first hand the benefits of your professional image expertise. When I became the Dean of the Carroll School of Management at Boston College in September 2000, I was certain that your professional image insights would be valuable to our students as well. The seminar you designed for us has not only helped the students prepare for interviews, but it has also significantly changed the way they view the importance of their overall professional appearance once they land a job. From using our students as models to the generous amount of time you spend answering individual questions from students before and after the program, it is no surprise that your curriculum has become one of the most popular professional development sessions we offer our students." "You were an absolute hit with a crowd of over 200 people! We have received tremendous feedback from people describing you as “sensational”, “dynamic” and “inspirational”. As a nationally recognized and highly respected consultant, speaker, and author, your messages on the importance of women presenting themselves with style and confidence in both their professional and personal lives encouraged a dynamic dialog. We welcome you back anytime"
I saw you speak at the NAPO conference in Chicago and wanted to thank you for participating in the Professional Image Workshop. You presented your knowledge with poise and polish — showing us by example how to make a good impression. I know it's a lot of work and I appreciated your advice, especially the suggestion that for us, dressing with an eye to detail leads to improved confidence and therefore to increased income. WOW. Lightbulb! Thanks. "All non-profits depend on strong leadership. Mary Lou Andre’s willingness to commit countless hours, personal resources and her impressive business acumen to our cause make her truly stand out among her peers...We are deeply grateful for the profound difference Mary Lou has made to end the devastating effects of multiple sclerosis." "I am a student at Northeastern University who attended your Dressing for Success Fashion show. I spoke to you briefly afterwards about my two upcoming interviews. The first was with the Oprah at Home magazine! Well, a week after the interview I was offered and accepted the the job for the summer. I attribute so much to your fashion show and the things you shared. The day after the fashion show I walked into Ann Taylor, immediately told the salesperson that I needed a black power suit, and an hour and a half later I was at the checkout counter purchasing beautiful black pantsuit. I topped it with a double string pearl necklace, simple pearl earrings, and pointy toed black shoes. Never before have I felt the transformative power of clothes in the way I did with this outfit. I knew I looked professional and I felt so confident. The greatest piece of advice that I took away with me from your show was that when you invest in yourself, you openly invite others to invest in you. I am so excited that the Oprah people invested in me! Thank you for all your help and extra attention. I honestly would have been lost and clueless without you." When I talked to you after the fashion show, I was astonished at your height. Not in a negative way, but you are not a tall woman, as neither am I. But I must compliment you, when you were up on that stage conducting the show, you held a presence that said you were at least six feet tall. Your confidence on the stage was amazing. Congrats, because I know that must have taken a lot of hard work." "I gave my husband Bill a Dressing Well Gift Certificate for his birthday. He was initially reluctant to use it. When he finally did, he had a great experience. His consultant, Elizabeth Fragala, was wonderful. In just a few hours, they excavated and assessed his closet, made a shopping list, and shopped for the needed items. Bill had a great time and liked his new clothes so much that when the next season rolled around, he took the initiative to book another shopping trip with Elizabeth on his own. Now that’s a successful gift!" ”I wanted to drop a quick line to thank you again for making Friday such a special day for all four of us. Putting aside the successful shopping, your ability to “click” with both young women (as well as with moms in tow) was terrific – both said they felt an instant rapport with you and June. I know that they hung on your every word and have already internalized a lot of it. I think they’re off to a great start just thinking about what they wear and what image that projects. As far as Michelle’s shopping went, we couldn’t have asked for more! She’s all set for interviewing season and the upcoming school year thanks entirely to you. Even my husband (who, with two daughters and a wife, gets more than his share of listening to “girl talk”) was amazed at what was accomplished in one short day and really liked her choices, especially the pin stripe suit. It was well worth the travel and every penny spent. Michelle says she certainly will be back to fill out her career wardrobe and I’m looking for a good excuse/opportunity to do it again, for ME! Our 16 year old is also looking forward to her turn – not for a few years, though. I am so thrilled with your service! I’m a big internet user, which is how I do all my initial research for every project. Your website was very helpful. Living in the middle of Wisconsin, I wasn’t likely to find a fashion consultant anywhere near me, so I knew virtual consulting would be the way to go! I knew your pricing without having to place a call as well as what that pricing included. You were very responsive to my e-mail asking for additional information. After having worked with your firm virtually, I find that I can now rule out 95 percent of the clothes I see online from vendors and retailers. You have saved me money and given me the best style education I have ever found. Thank you! Dressing well is more of a science than one might suspect, asserts wardrobe consultant Andre. Five strategies are at the heart of her philosophy, beginning with an assessment of lifestyle and proceeding to the development of a shopping focus. The emphasis is on clothes investment strategy: the building of a base wardrobe, assessing your clothes, understanding your own style, and then and only then, venturing out into the stores. Lest the subject seem too frivolous, she inserts personal anecdotes and "insider tips" that do help streamline wardrobe management. Some examples: if purse switching happens frequently, consider storing cosmetics, glasses, and other handbag paraphernalia in small, zippered pouches. The minimum number of shoes for work? Three—dress pumps, loafers, and ankle boots. This handy book functions as a refresher course for those who continually moan about having nothing to wear as well as a basic reference for new-to-business women workers. “I wanted to let you know I picked up your book "Ready to Wear" and read it on a dreary Sunday afternoon. It was terrific. Less than halfway through the book I grabbed a highlighter and some post-it's!! Now, I can't wait to re-read the book while dissecting my closet and wardrobe! Thanks for a great book filled with terrific, easy-to-understand, thus easy to follow-through tips! I've decided to purchase the book for my sisters, mom, and girlfriends. What a fun thing to share...organizing your closet, organizing your life!" “I love your book — my suede boots are now standing tall insulated with rolled magazines. I'm so motivated — and have begun to weed out old clothes and organize. Thank you!" 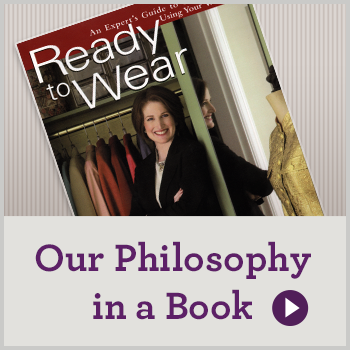 “Mary Lou Andre, a nationally recognized wardrobe consultant and owner of Organization by Design in Needham, Massachusetts, has written a practical and engaging book called "Ready to Wear: An Expert's Guide to Choosing and Using Your Wardrobe" (Perigee, 2004). Mary Lou dresses several of my colleagues and is known for her no-nonsense approach. Her book has a great chapter called "Shopping in Your Own Closet" and is filled with great tips to help you find your personal style and get yourself together. Thanks to Mary Lou, I now have a larger hairbrush and a special pouch with my lipstick and Lactaid in my pocketbook, so I can pull them out in a flash, instead of digging around forever." "This book is like having a personal wardrobe consultant. Mary Lou Andre makes looking good effortless. Her tips will help you look better for less by making the most out of what you already have. It is ideal for the fashion savvy as well as the fashion challenged." “I wanted to let you know how much I enjoyed reading your book. As a result, we added more shelves in my closet for my pocketbooks and totes. We put a bright crystal light on the ceiling and I put crystal drawer pulls on the wall for scarves and necklaces. Bob even decided to build shelves for his side of the closet. I couldn’t believe it! What an inspirational book. I wish you great success. My daughter-in-law is reading the book now and loves it too!" “I recently purchased, and read, your wardrobe organizational book and I love it!!! I have purchased many books in the past but never have I found one as thorough and complete as yours. Thank you!! Finally, click here to read a detailed letter from a real estate agent who put the concepts of “Ready to Wear” to work in her own life and experienced dramatic results after attending one of our seminars. "Just wanted to let you know how much I enjoyed working with Elizabeth today. She was wonderful — organized, efficient, handled the sales personnel, and (most important) not only knew what looks good, but why. I’m very happy with my purchases and feel much more confident about my upcoming conference. Thanks so much for setting up the consultation."